ABBOTT MOTORS, An exceptional car buying Experience, is offering this exceptional vehicle for sale. ABBOTT MOTORS has over 50 years of automotive experience! We are also a CARFAX Advantage Dealer. We offer great deals and specialize in FINANCING FOR EVERYONE-ALL CREDIT APPS ACCEPTED! We look forward to helping you purchase your next vehicle. CALL or TEXT (716) 229-5711 for quick answers to your questions about this vehicle. Your message will be answered by a real human never an automated system How to protect your purchase? CARFAX BuyBack Guarantee got you covered. Outstanding fuel economy and sleek styling are two great reasons to consider this Dodge Dart. This sporty Dart SXT is well maintained and has just 43,810mi. This low amount of miles makes this vehicle incomparable to the competition. Pre-owned doesn't have to mean "used." The clean interior of this Dodge Dart makes it one of the nicest you'll find. Most vehicles are forgettable, but then there is the 2015 Dodge Dart SXT. This high-performance vehicle provides a memorable experience each time you drive it. The engineers at Dodge, without question, designed a masterful automobile that provides all of the "essential perks" needed for someone like you. 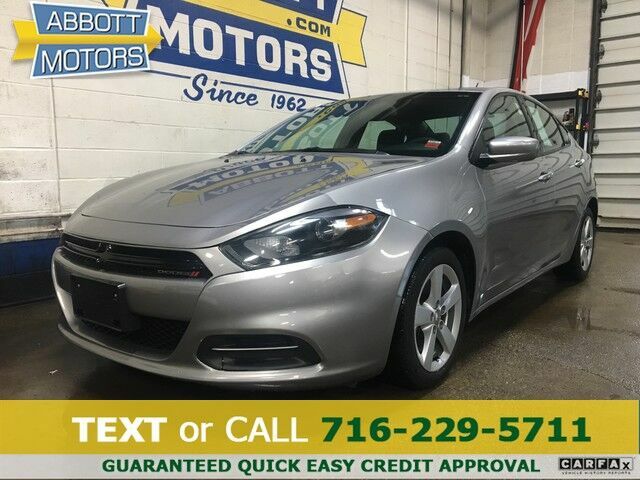 This Dodge Dart SXT comes standard with features that are essential in the 21st Century. However, Dodge decided to take it one step further and add a handful of quintessential options that will undoubtedly add to this vehicle's quality and value. Searching for a vehicle shouldn't mean that you have to buy one with flat, bald, and outdated tires. In the case of this 2015 Dodge, the tires have been recently replaced and show to have good tread. This vehicle's exterior has been babied. The paint is in excellent condition with nearly zero flaws or signs of age. The standard wheels have been upgraded to gives this vehicle a whole new style. More information about the 2015 Dodge Dart: The 2015 Dodge Dart is a compact car competing with the likes of the Ford Focus, Toyota Corolla, Hyundai Elantra and Honda Civic. Dart models start at just over $16,000 for the SE and top out at about $23,000 for the Limited. Buyers get world-class styling and lots of customization options with the Dart, including three available engines and transmissions. Styling is customizable too, with Dodge offering a "Rallye" version that significantly changes the look of the vehicle. This model sets itself apart with a model to suit every need, efficient, powerful and economical, and Sporty STOP IN TODAY or Apply Online 24/7 at Abbottmotors.com ... All Trade-ins Welcome... Same Day Delivery... Call or Text Today and See The Difference... We Look Forward to Serving You! !This vehicle may be subject to potential open recall(s). Vehicle recall information may be found at Safecar.gov. Please verify price, equipment, options and features with your sales rep before your purchase. We Look Forward to Serving You. *Tax, title, plates extra. All Financing On Approved Credit. BBB accredited A+ member.